From our fully-equipped centre our practitioners offer an extensive range of osteopath and massage treatments to patients from Seaham and beyond, tackling the after effects of accidents and injury alongside common conditions that cause discomfort and impact on your everyday life. Vitaphysical opened in 2007, then named Sunderland Back Centre. Founder Jason and Bronyia have since changed the name to reflect the clinic’s more inclusive range of services, which grew to meet the demands of their client base. A back pain centre is still held at the clinic, alongside frozen shoulder and neck pain sessions. However, the treatment list is now far more extensive, incorporating programmes to combat everything from sciatica through to posture problems. You can find a list of the conditions we treat on our treatments page, though we’re always happy to discuss your personal issues and possible courses of treatment, just give Jason our osteopath a call. Talking through your individual condition will help us match you with a professional in our team. Each has an individual specialism, from osteopathy through to sports massage. Our massage therapists Bronyia, Emma and Kirsty offer a comprehensive collection of massage treatments including deep tissue massage, relaxation massage, sports massage, Thai massage and pregnancy massage. Many of our massage clients come from the Seaham area, finding us through personal recommendations. 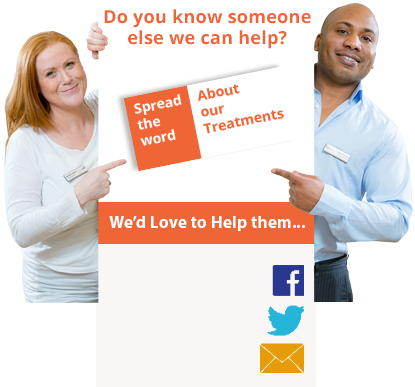 We’re exceptionally proud to share patient success stories on this site. By talking to you about your individual symptoms we can match you with the course of treatment and practitioner that’s right for you. You can book an appointment with us online using our online system or call 0191 565 8886 to discuss your personal requirements. We’ll guide you through everything you can expert during your treatment, including the introductory offers available to your on your first visit. The Vitaphysical treatment centre is just a short 15-20 minute drive from Seaham along the A19. We provide free patient parking and are also within easy walking distance of the train station and metro station, should you wish to travel by public transport. A map of our location can be found on our contact us page.